Film sets can sometimes be dangerous, and accidents happen. Report any injuries sustained during production with this Injury Report Form for film and television productions. A separate report form should be filled out for each injury occurring either on or off set, if it is connected with the shoot. The form must be completed by a witness to the incident. This is a reusable form - download it, save it as a template, use it as often as you require. It can be filled out by hand or on a computer. Buy the Film Production Injury Report Form, download it, and give copies to all departments. 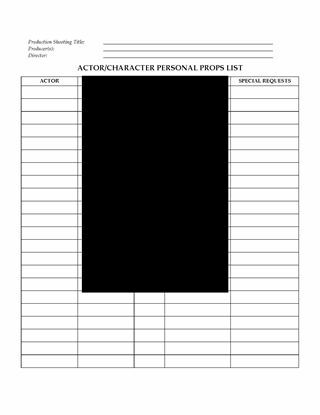 Create a Personal Props List for each actor in a film or television production with this easy-to-use template form. The props list allows the Props Department to track personal props by actor and/or character. The tracking list helps to ensure that all the items are on set before filming each scene. This is a MS Word template which can be filled in electronically or printed out in blank and filled in by hand. Don't take a chance on losing or misplacing important props. Keep track of everything with this Actor and Character Personal Props List. Are you doing location filming? You need this Film Location Contact List. When on location, your crew needs a list of the property owners and other persons that would need to be contacted if there were any problems (lost keys, no access, damage to property, etc). Fill out the form with the relevant information for each person and provide copies to every department. The form is a MS Word template which can be filled in electronically or by hand. Don't go out on location until you've downloaded the Film Location Contact List.